Audrey Elisabet: What I wear | For Halloween. What I wear | For Halloween. It has been quite a while since I did one of these! And I am maybe a little late with the theme, since Halloween was last week. 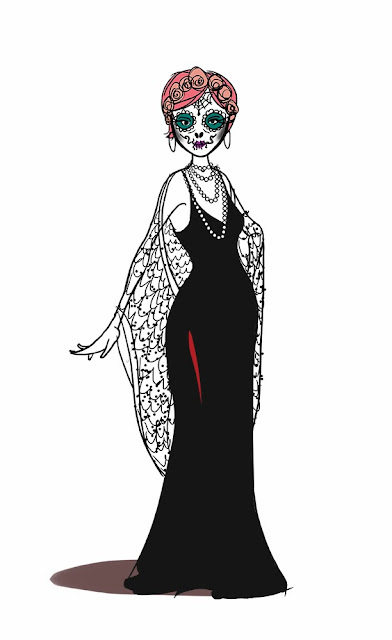 I just had on such a fabulous costume that I could not skip sharing it on the blog. The family was invited to the annual Halloween party my great uncle throws. I had no clue what I wanted to be, so when we went costume shopping I got overwhelmed with all of the choices and ended up not buying anything. On the way home my mind was racing, and suddenly it dawned on me! 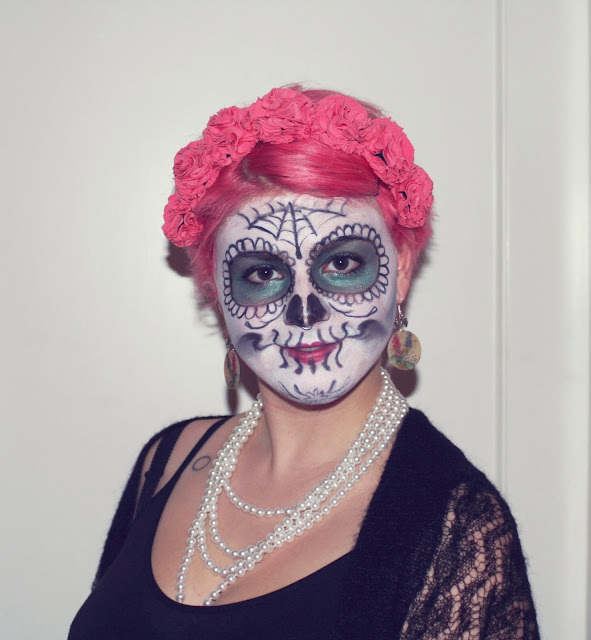 It is super easy to pull together a pretty decent Día de Muertos costume. I spent about an hour and a half on the make-up, put on some fancy clothes, a flower headband and a pearl necklace, and I was good to go. I have not been as happy with a costume since I sewed my own Harley Quinn outfit a few years back. It was also really nice how many compliments I got for my make-up, since I'm usually an only-mascara kind of girl, and don't have much experience beyond that. The flower headband my sister loaned me also matched perfectly with my new PINK hair. Btw. I was not as much of a babe as my drawing indicates. I just really like drawing pretty girls. As we were driving to the party we looked like a funny company. Ylfa was a nun, my dad went as Jesus, my mom as Where's Waldo, one of my brothers was Chucky and the other one was Charlie Chaplin. The costumes at the party were also great! I really love putting on a costume, and seeing other's. It isn't often that it is socially acceptable for people to dress up that funny. We all had a blast that night.